Pompeii is one of the most famous archaeological sites in the world, and almost everyone knows the gist of the story of this city which was buried under ash when Mt Vesuvius erupted in 79AD. We’ve long wanted to visit, and it was near the top of our list of things to do in Naples (after eating pizza of course). We had to wait for almost a week into our stay for a day with no forecast of rain but it was worth being patient. 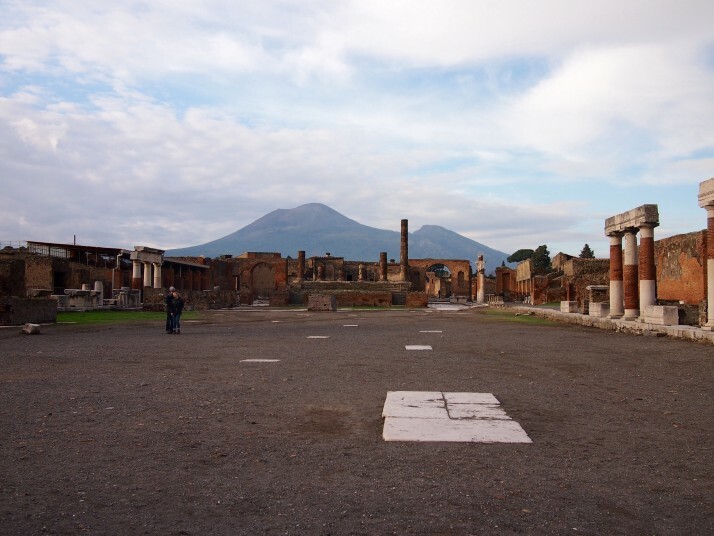 Vesuvius had been rumbling for several days, maybe weeks, before it erupted violently on 24th August 79AD, and many of the townspeople (an estimated 17,000 from a total of around 20,000) had already fled to safety leaving only those too poor, sick or otherwise unable to move. A violent tremor signalled the start of the eruption, and lapilli, small pumice rocks, rained down to a depth of three metres in just a few hours. Many were crushed as houses collapsed under the weight, those who survived were killed by the blasts of toxic gas and ash which followed and completely buried the city. During the early excavations, archaeologists found some cavities containing bones and the director, Giuseppe Fiorelli, had the genius idea to pour plaster of paris into them to form the shapes of the people buried in the ash. We’d heard about this before our visit and expected them to be positioned where they had fallen but for the most part the casts were in glass cases which I suppose makes sense from a preservation point of view. One of the rare information boards had a quote from a 19th century visitor describing them as “not art, nor imitation; it is the bones and relics of the flesh and clothing mixed with plaster” and this really hit home when we saw one cast where the skull was visible. As well as plaster casts of people, archaeologists have been able to make casts of animals such as a dog, as well as wooden items which have decyaed away over the centuries including a cupboard and a door. Even more ingeniously, more modern archaeologists have made casts of the roots of plants which decomposed under the ash enabling the reconstruction of whole gardens. 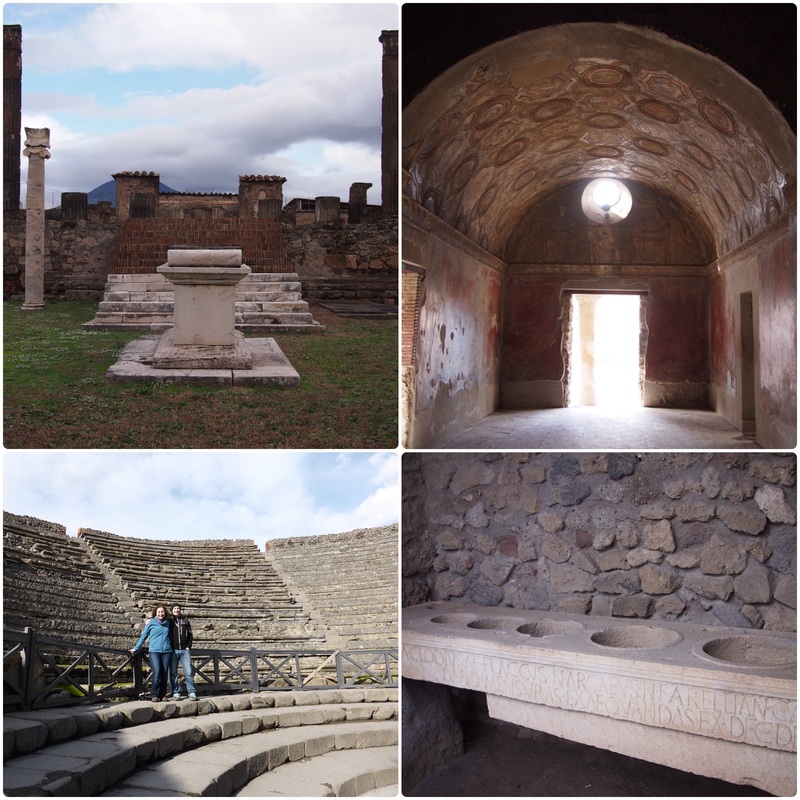 Pompeii had a clever water supply system. Water was collected in the hills and carried to the city by aqueduct. Because the city is on a gentle slope, taps throughout the streets could be fed by gravity. Most of them still work and, as the water is potable, they were handy for refilling our water bottle. 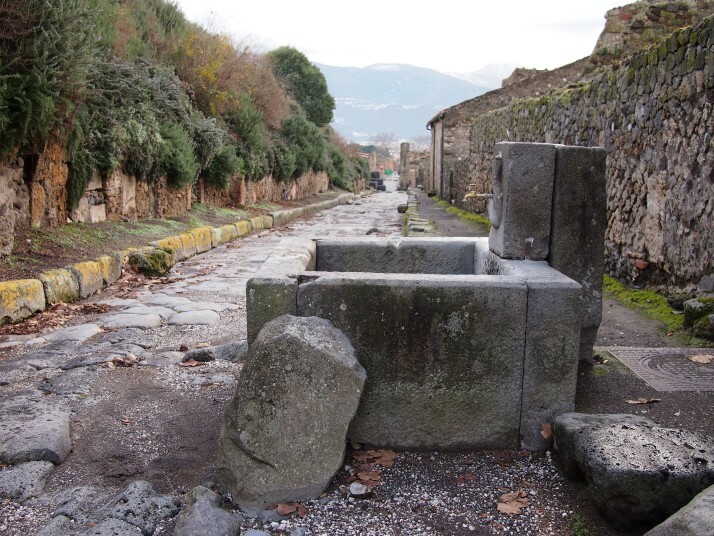 Unfortunately the sewerage system wasn’t so advanced and so waste liquids were thrown out into the street and washed downhill meaning that residents needed high pavements and stepping stones to prevent them treading in something they’d rather not. Donkey carts passed between the stepping stones and cart ruts are worn into the cobbled streets in many places. Not all of the site’s buildings are open every day – it is dependent on archaeology work, restoration, and staff availability so it’s not possible to make an exhaustive list of what you want to see before you arrive. We found a few recommendations online but pretty much just tried to tour as many as we could of the buildings that were open on the day we visited (helpfully assisted by the lady in the information office marking them up on our map). For that reason we never knew quite what we were going to find when we went into an open door. 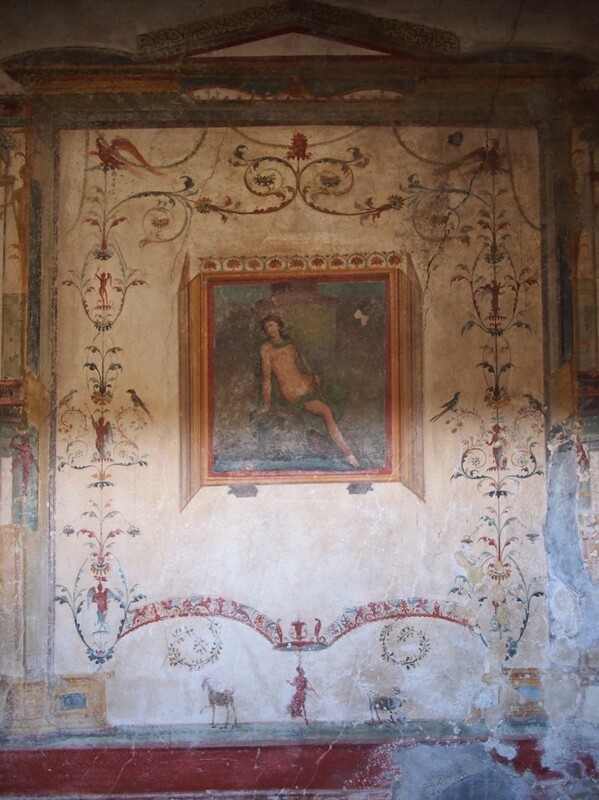 We were often surprised by the vibrancy and good condition of the frescoes – it’s hard to believe that these are 2000 years old and that they were painted onto someone’s living room wall – it beats wallpaper any day! 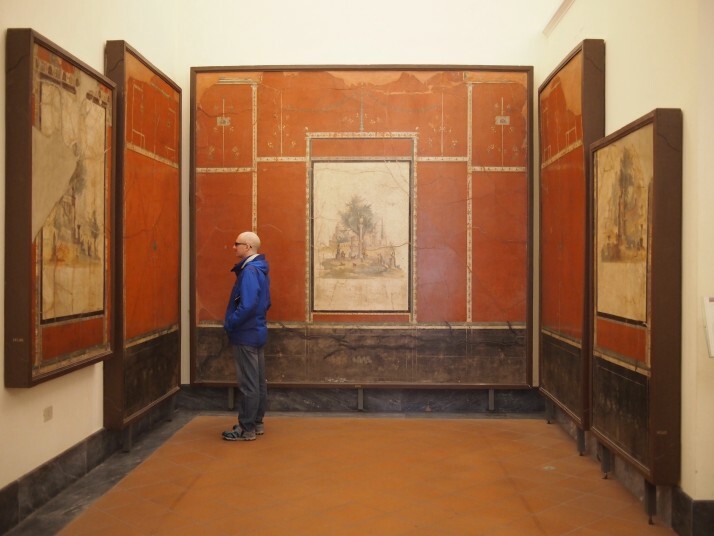 When we visited the Stanze al Genio museum in Palermo, our guide Claudio showed us a tile picture of a dog and told us that it was based on a famous Pompeii mosaic so we were keen to find the original. 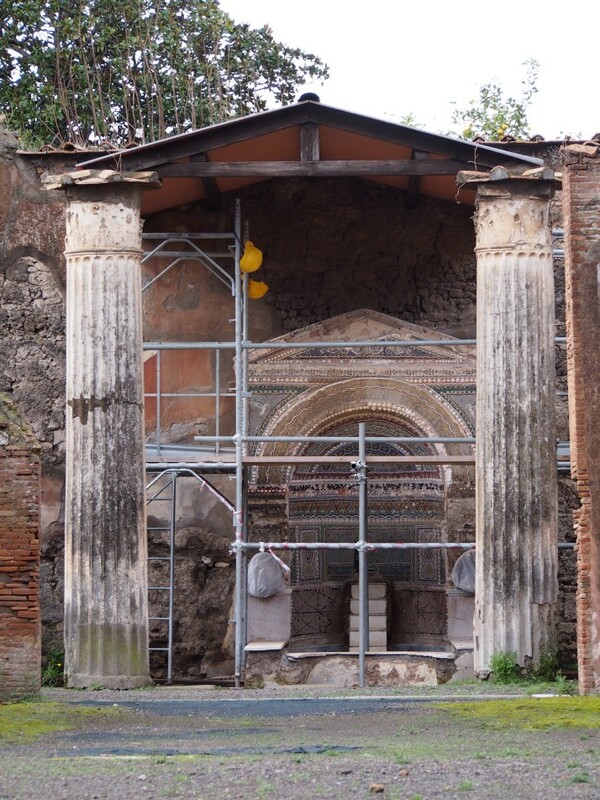 It’s situated at the entrance to the ‘House of the Tragic Poet’ and the words on it, ‘Cave Canem’ translate as ‘Beware of the Dog’. It’s a bit classier than the little plaques used nowadays! As well as houses there are a wide variety of commercial buildings – temples, public baths, fast food joints, theatres, even brothels! The wall paintings in the brothel are pretty explicit and apparently served as either a ‘shopping list’ or as inspiration for patrons! 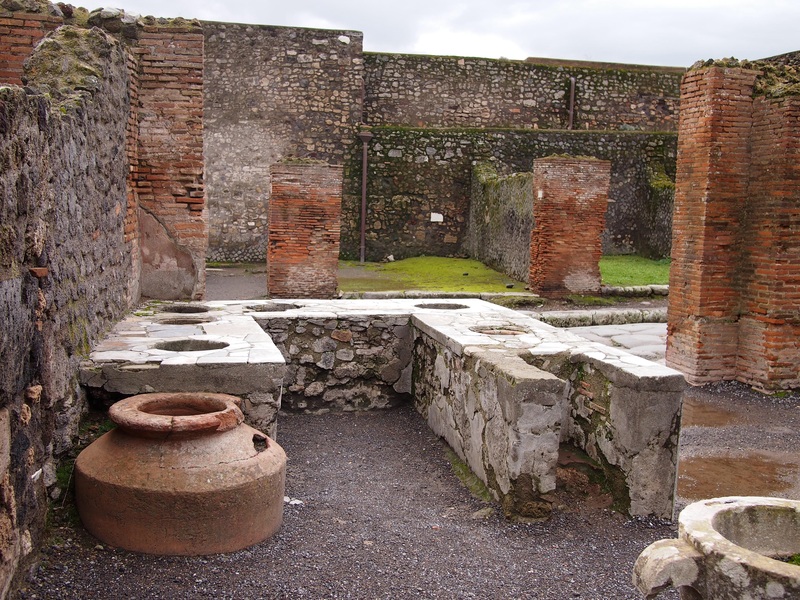 I really liked the thermopolia or snack bars, a U-shaped counter set with a number of terracotta pots from which food was served. For us one of the unexpected features of the site was the cemetery. Somehow we hadn’t thought about the fact that people had lived and died there before it was buried in ash. 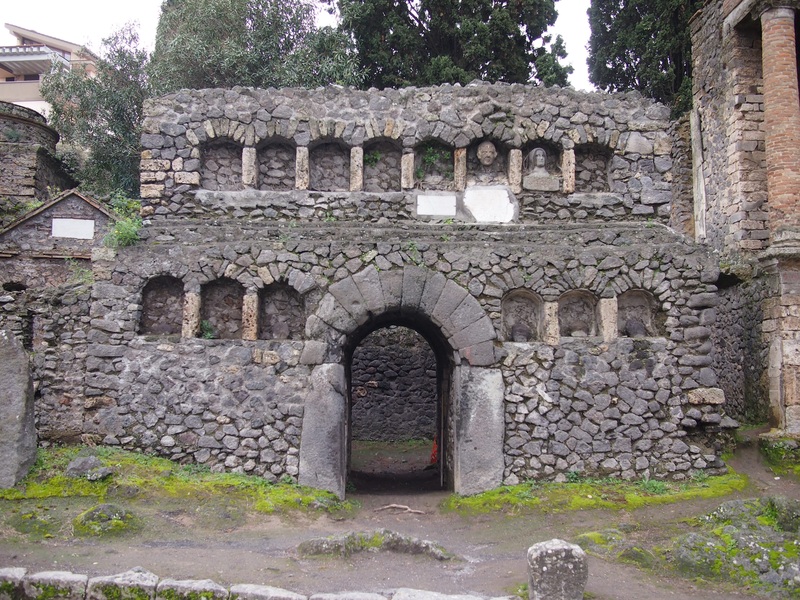 Roman law stated that burials should always be outside the city limits and so the grand tombs line the road outside the Nocera Gate. This also ensured that there would be plenty of passers-by to make offerings and pay tribute as they passed. 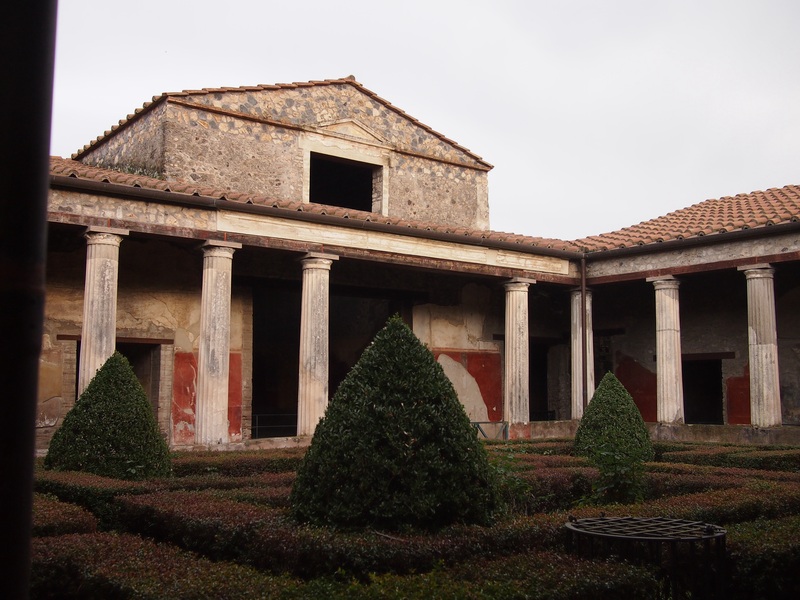 On the first floor were several rooms with frescoes from Pompeii. The painted plaster has been cut out of the wall and put into frames for display. 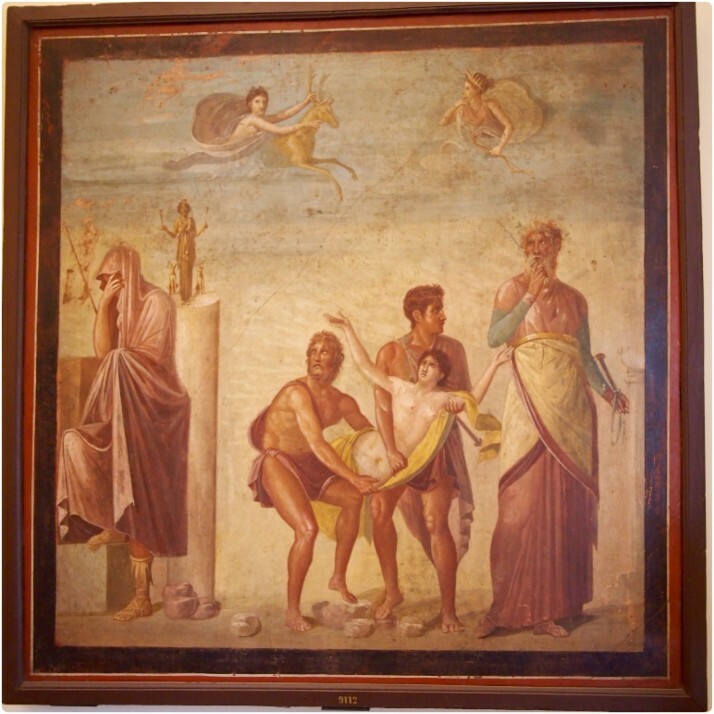 We thought they looked to be much brighter and of even better quality than most of the ones that we saw at Pompeii itself although we weren’t sure whether that was because the best examples were the ones chosen to be removed or because the museum’s environment was better for their preservation. 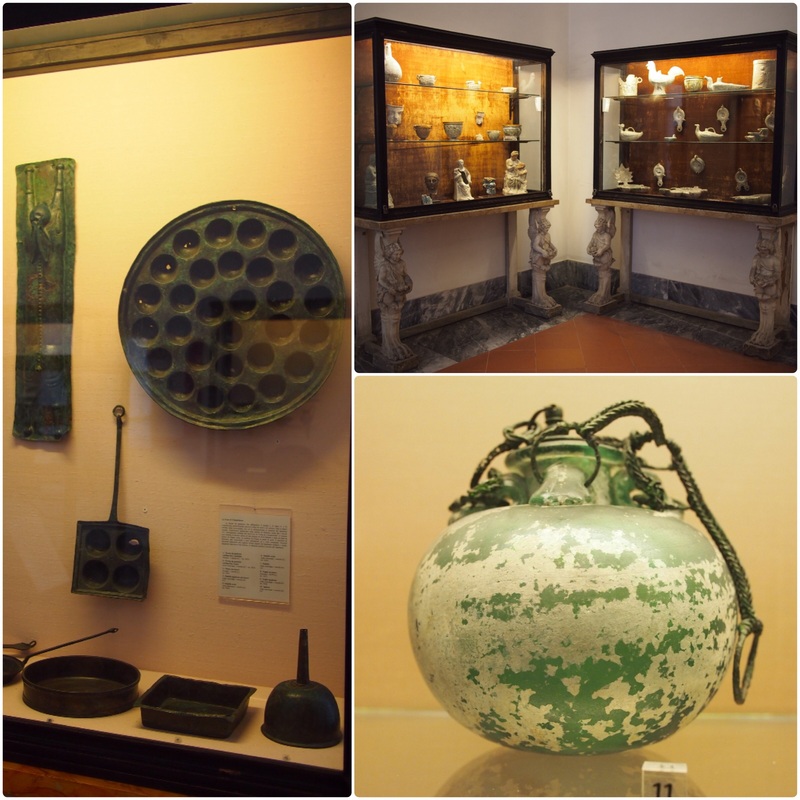 I really enjoyed looking at the exhibit containing smaller items unearthed from Pompeii including pots and pans, door knockers, oil lamps, pottery and even glassware. Some of the glasses had been distorted into strange shapes by the heat but I was surprised that any at all had survived intact. Apart from the ‘Beware of the Dog’ mosaic the only other one that we remembered was a replica in the ‘House of the Faun’. 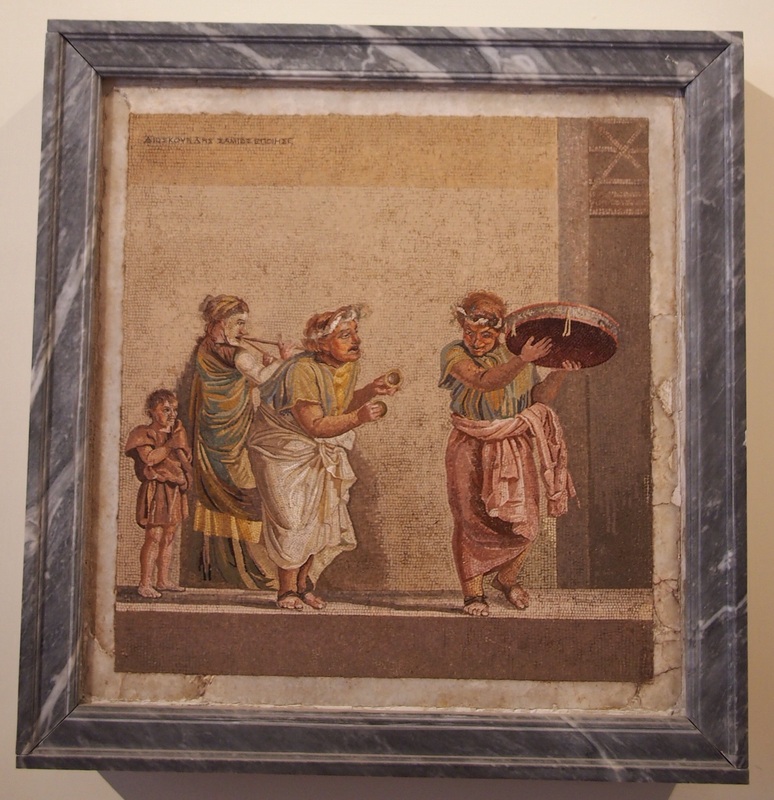 We sought out the original in the museum and were surprised to find lots of mosaics on display and of breathtaking detail. Even after seeing the floors at Villa Romana del Casale I’m still amazed at how good the Roman craftsmen were. After looking through the exhibits containing items from Pompeii we returned to the ground floor for a look around the collection of antique marble statuary acquired by the Farnese family in the 16th century and a whirlwind five minutes checking out the exquisitely carved semi-precious stones called the Farnese Gems (the guard was about to lock up for the day when we arrived but he let us in for a peak). We’re really pleased that we visited the Archaeology Museum as well and definitely think that we did them in the right order. Going to Pompeii first gave us an overview of the setting and context of the artefacts so that we could better appreciate the museum, and I think if we’d done them the other way round it might have given us an unrealistic expectation of what we would find at the archaeological site in terms of quality of artwork. 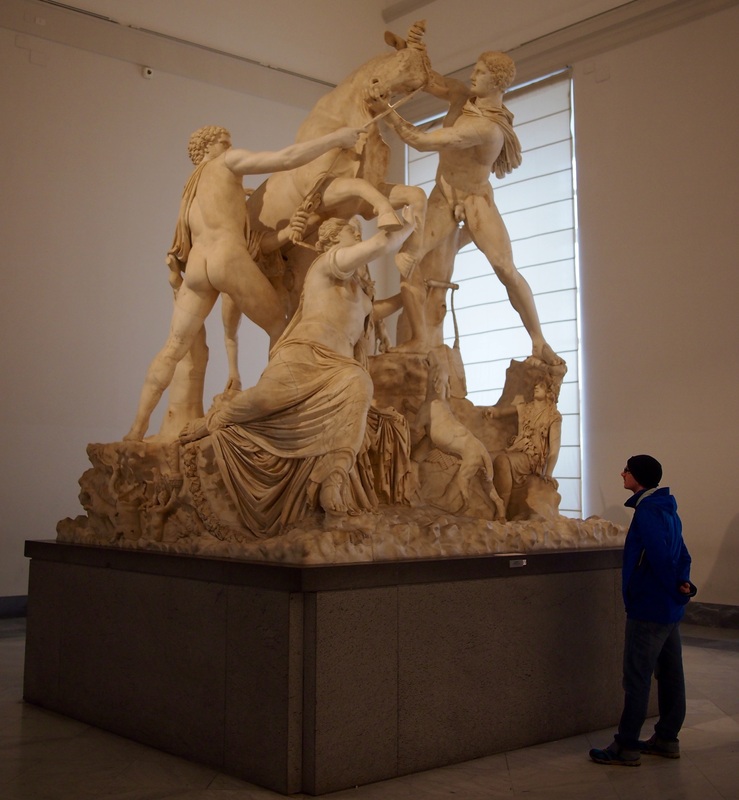 This entry was posted in Places and tagged Art, Italy, Museum, Naples, Pompeii on February 1, 2015 by Julie. I don’t think I did the archaeological museum when I went to Pompeii. Seems like I missed some good stuff. 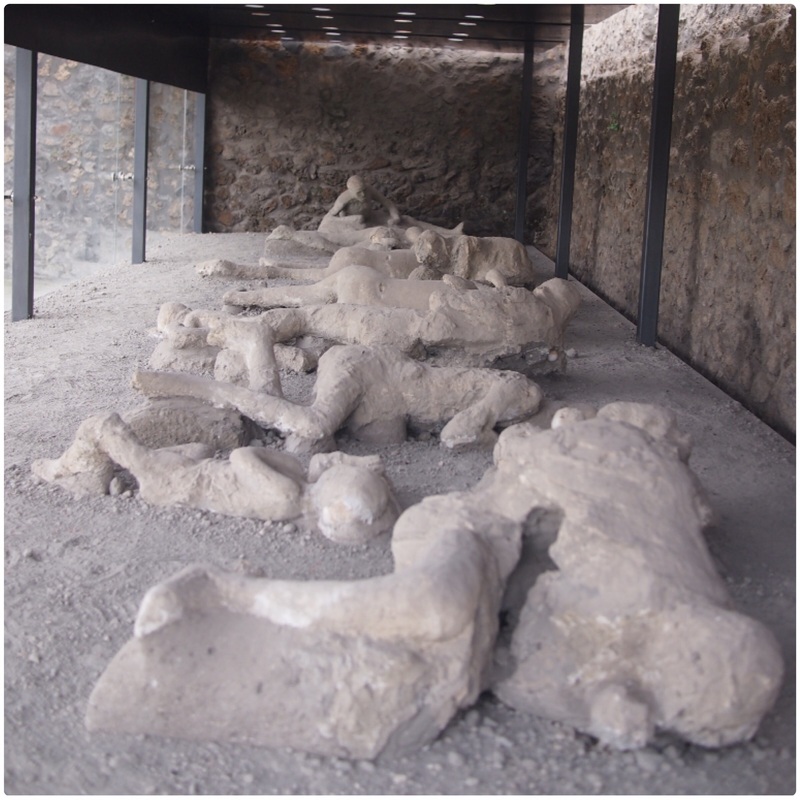 Are you going/have you been to Herculaneum? No plans for Herculaneum. 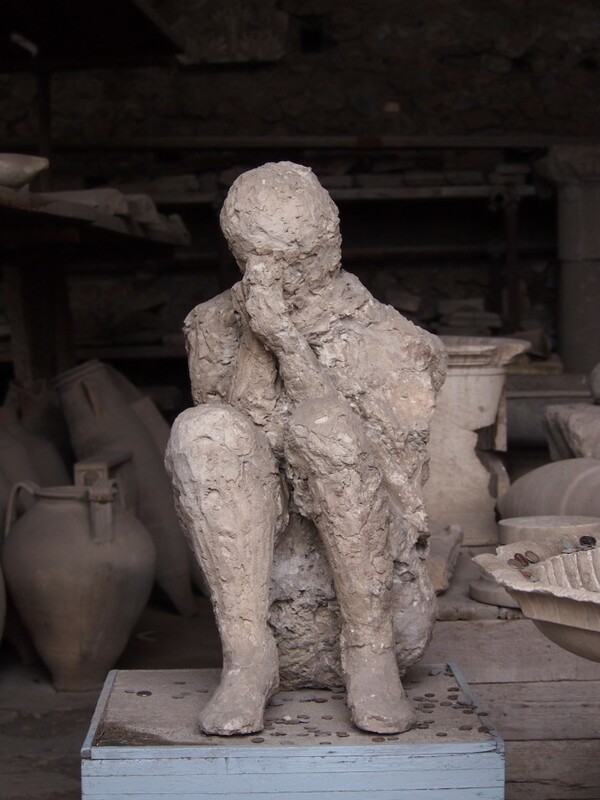 We have a limited capacity for archaeological sites and thought that Pompeii plus the museum in Naples might be enough… Would you recommend it? I haven’t been – I want to go. I think Mum and Dad have been and it’s supposed to be very different; smaller, but more complete. 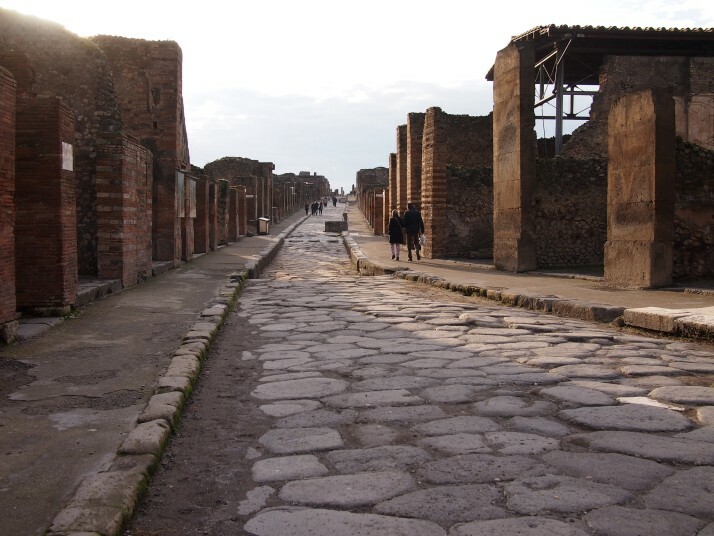 No, we haven’t been to Herculaneum – we would have liked to because I think far more has survived than at Pompeii. Go if you have time. 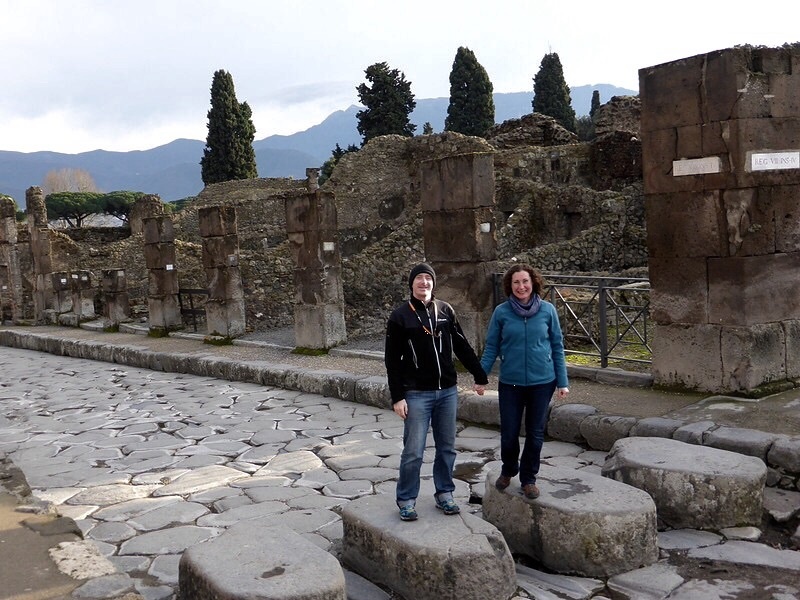 Nor have we been to the museum – we were on a walking holiday and only had enough time to visit Pompeii. We got rather frustrated with the guide that kept telling us to visit parts that were closed because they can’t afford to pay the staff to maintain them! Haha, so none of us have been then! We left Naples today so it’s been added to the list for if/when we return. I read that it was where the wealthier people lived so more sumptuous decor and a different kind of eruption so more was preserved. There was an interesting exhibit in the museum on some papyrus scrolls recoved from Herculaneum which although badly charred have been unscrolled and a lot of otherwise unknown texts recovered (not recently, a couple of hundred years ago I think). We were very glad that the lady in the info office marked up our map with the buildings that were open and the streets that were closed or we would have spent ages trying to get to open buildings too. There does seem to be a dire lack of funds in the Italian Ministry of Culture which is crazy considering how many visitors they get. The websites are dreadful with basically nothing in English and the Archaeological Museum had various areas closed off due to lack of staff as well. What is 17 + 33 ?